Have trouble falling asleep, staying asleep or just feeling rested? Your own habits and behavior could be the problem. Some people lay in bed staring at the ceiling in part due to chronic pain, depression, medications or other substances that can interfere with sleep. When you treat those conditions, often it will naturally help improve their ability to sleep. 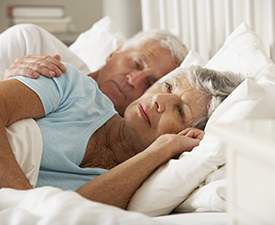 However, despite addressing other medical or psychiatric co-morbidities, sleep difficulties often will persist. People who have chronic insomnia worry excessively about sleep and the effects of insomnia. They also become more and more agitated and tense as bedtime gets closer. “If you’re very worried about getting good sleep, you can put a lot of effort into getting sleep and have a lot of anxiety at nighttime. This makes you more alert and can keep you lying in bed wide awake,” says sleep disorder specialist Michelle Drerup, PsyD. Here are some suggestions from Dr. Drerup that can help anyone improve their sleep habits, including psychophysiological insomnia sufferers. “Trying to break some of the patterns that people have developed is often the key,” she says. You can improve your sleep by ensuring that you have a consistent sleep schedule. Avoid staying up late on weekends and sleeping in, then trying to go to bed at your regular time on Sunday night. Going to bed early or sleeping in to catch up only leads to more fragmented and poor-quality sleep. Typically, you go to bed two hours early and then just lay there wide awake, continuing to associate your bed with not sleeping. Give yourself a couple hours of quiet, relaxed time before bed as a buffer. Do something relaxing. This will be different for each person, whether it’s reading a book, taking a warm bath or having some decaffeinated herbal tea and watching television. If you can’t fall asleep, get up and try to restart by doing something to distract yourself before going back to bed. It could be reading a book (though not a thriller/page turner), flipping through magazines, watering the plants or even knitting. Avoid anything that’s goal-directed or too physically or mentally activating such as house chores, paying bills or working on a computer. Learn relaxation techniques such as meditation, guided imagery and progressive muscle relaxation. A sleep specialist can help you learn this as well as ways to calm your mind and your muscles and reduce or eliminate all the racing thoughts and worries. Dealing with stress in a healthy way is important. “Practice the relaxation techniques and develop them as a skill during the day when you feel good and are already calm, rather than trying to do them for the first time at bedtime,” Dr. Drerup advises. You should also keep a detailed sleep log that records your sleep habits. This can help you see trends in your behavior and will be useful when you discuss your insomnia with your physician or a sleep disorder specialist. You can also try online sites and cell phone apps to help you keep a log.